On the first day of class, Professor Schlund-Vials does something unheard of. Impressed by this teaching tactic, Ali develops an “office-hours crush” and finds herself welcomed in Professor Schlund-Vials’s office. They talk about everything from dogs to family history to race. During these visits, Ali realizes that Professor Schlund-Vials is not only easy to talk to but she’s helping Ali work her way through an educational sore spot. Cathy and I on the day of the interview. 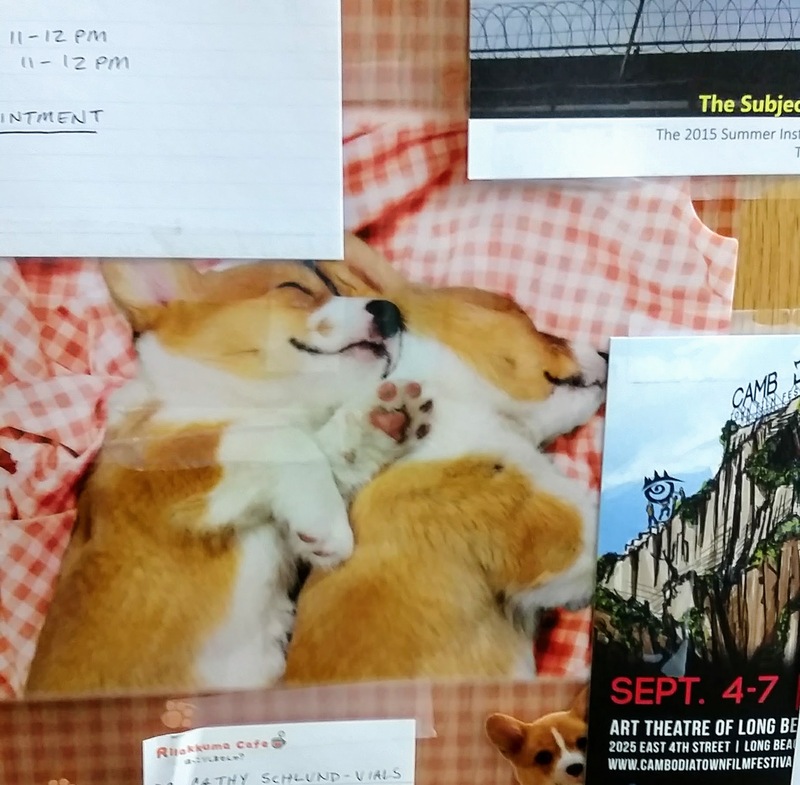 The picture of Corgi puppies spooning taped to Cathy’s door. ALI OSHINSKIE, HOST: It’s the first day of class and there are two photos projected on the screen. One photo, the professor tells us, is from April 29th, 1975. There’s a helicopter on top of the roof of a building and the staircase leading up to it is packed with people. 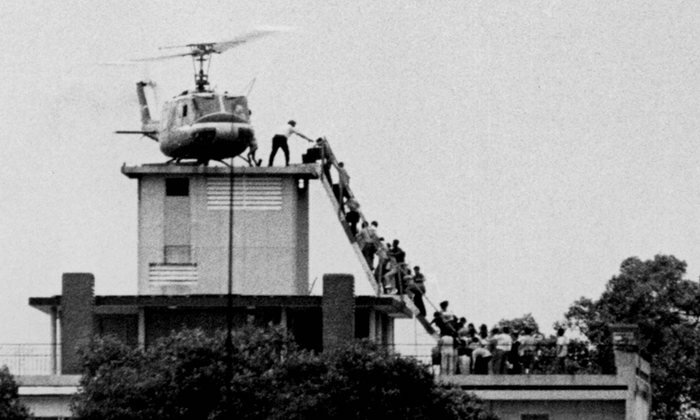 This is the image that has come to symbolize the fall of Saigon. And then there’s another image. 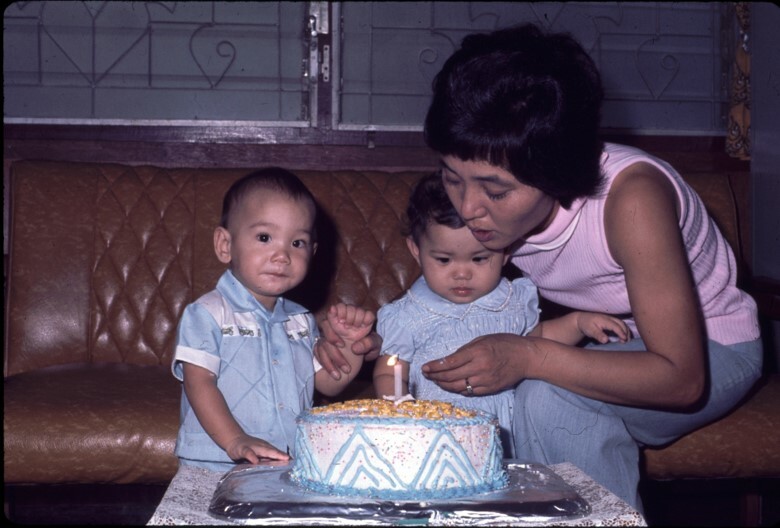 Two toddlers, their mother, and a birthday cake. And then she tells us the story behind this photo. CATHY SCHLUND-VIALS: I was born September 2, 1974 and I was actually born in Thailand, outside of Royal Thai Udorn Air Force base which is the northern part of the country, um, very close to the Laotian border and just so happens that that Air Force Base was the headquarters for the Air America Fleet and that was the CIA owned fleet. The images of helicopters that are rescuing Vietnamese refugees and people trying to get out of the fallen city of Saigon; those were helicopters, that were CIA owned helicopters, they flew out of this air force base. So I mention all this because my biological mother was a Cambodian woman who married a Thai pilot who was being trained by the CIA and by the Air Force to fly missions. She had an affair with an American G.I. who was stationed there. She had two children, two mixed race children – me and my twin brother – and my biological father was actually married he had four kids in Leominster, Massachusetts and he left. And here’s my biological mother and she’s married, has had an affair, and she’s looking to give up two children. And it just so happened that my adoptive parents – so my mother’s Japanese, my father’s American they were stationed at that Air Force base. And for the first thirteen years of my parent’s marriage they had been looking for children and part of the reason they were looking for children is my mother was eleven years-old when the bomb at Nagasaki was dropped and she lived roughly 20 miles outside of Nagasaki and she would never talk about this, I’ve mentioned this, she would never talk about radiation or things like that but none of the women in her family have ever had children. So she had spent all this time with my father looking for children and they find two mixed-race children and they adopt us for $25 dollars (laugh), you know it’s a war. Um, and then we eventually leave and that’s the photo, like the photo that I show, that’s the first family photo, that’s my first adoption photo. So actually, that’s the story. OSHINSKIE: Do you have, like a good joke? SCHLUND-VIALS: Not one that’s appropriate. OSHINSKIE: (laughter) I want people to know you’re funny in this podcast. We talk about a lot of serious stuff…and you’re funny. SCHLUND-VIALS: I know, but I’m awful at telling jokes. OSHINSKIE: I’m Ali Oshinskie and this is Professors Are People Too, a show about the friends you didn’t know you could have, the advice you didn’t know you could ask for, and the professors you didn’t know were like — people. OSHINSKIE: After hearing that story, I realized that I didn’t know anything nearly that personal about my other professors. This is a space that students and professors just don’t go to. But for Professor Schlund-Vials, this space is an inroad to teaching. It’s how she contextualizes it. It’s a personal history, but it’s also an academic history. On the first day she showed us two images related to the fall of Saigon. She found one of them on the internet and the other in a family album. SCHLUND-VIALS: I knew that I was part of the Vietnam War, but I didn’t understand the specificity of it. I mean I think history matters, considerably especially when you don’t know that history that brought you into being, and so for example, I have thought for the longest time that I was Thai-American. Because I was born in Thailand and I remember being 23, about to go to graduate school made a made a joke with my dad that the only film for Thai people was the King and I, just like this musical. And he said “No your film’s The Killing Fields. You’re actually Cambodian.” And I never really thought about that because it had never really been expressed. And it just really threw me for a loop because I had no idea about Cambodian-American experiences outside of a very limited knowledge of the Killing Fields, um, Era which was the period where 1.7 million Cambodians perished, right? In a three year, eight month, twenty-day period, under an authoritarian regime. But I didn’t know the specificity of that and I felt completely displaced because I had predicated my entire life, up to that point, being an entirely different type of South-East Asian American. And for me that’s like all the work that I do is personally driven. It’s historically based, um and then it’s usually focused on race but it does come out of that not knowing. And so I share that with students, but I think that we all have that like there are certain family histories that don’t make sense unless you apply, like kind of other historical frames to that. So I’m not exceptional. I think it’s pretty like kind of normal. OSHINSKIE: I found this funny. If this wasn’t exceptional, then clearly I‘ve been asleep when other professors personally contextualized the entire course on the first day of classes. But she’s right: it’s not exceptional to have family stories woven into significant historical events. But for Professor Schlund-Vials, her family album didn’t come with a comprehensive history. So she had to uncover it herself. SCHLUND-VIALS: So I use that experience because that I think that it individualizes it and it’s about like, what’s forgotten because like what I’ve just told you which took a very chronological format. OSHINSKIE: She means the story of her birth and her adoption. SCHLUND-VIALS: That took me years to put together. You know because my parents never talked about it. I would have to ask questions and then do a little more research and then ask a different question. Or like learn to listen silences that my parents weren’t talking about. And so listening to silences are just like what is not said or what’s said differently. OSHINSKIE: Listening into those silences Professor Schlund-Vials maybe the coolest war story I’ve ever heard. SCHLUND-VIALS: My father doesn’t really talk about the Vietnam War in the way I would expect a veteran to talk about the war. But what he talks about are the things that impacted him for example, the fact that his job was to load the munitions onto aircraft. And he just mentions “Oh well, sometimes if you’d just put a piece of paper into the lock mechanism and the pilot would go off: that would actually prevent a bombing. And it wouldn’t kill anybody, but it was just a little piece of paper.” And it was just like he wouldn’t say he did that because that would be something that was kind of like illegal and you know, but it’s kind of like a profound piece of knowledge that would only be known to somebody who had experience with that or knew of that practice, right? OSHINSKIE: What an amazing story! At this point, I had what I’m going to call an “office hours crush.” Professor Schlund-Vials clearly has really cool stories and I wanted to hear them all. So I know I’m making this podcast about professors and going to their office hours, but normally I get kind of nervous. It’s not that I think a professor is gonna bite off my head, I just don’t know if we’ll have anything to talk about. I get mixed messages from professors and how they present their office hours. Are office hours for MLA formatting questions and begging for an extension on a paper? Or can I come in and we can just chat? One day, I happened to be walking past Professor Schlund-Vials’s office and her door was open–all the way. It was welcoming, and she taped a picture of two Corgi puppies spooning on it, so I considered that my invitation and I just walked in. SCHLUND-VIALS: Just one Corgi and an Elkhound. SCHLUND-VIALS: A Norwegian Elk hound. OSHINSKIE: Is that like a hound kind of dog? SCHLUND-VIALS: It looks like a German Shepard that was put in a dryer and then it was made into a medium-sized dog. OSHINSKIE: And then we talked about Mexican food. OSHINSKIE: I went there, it’s good. OSHINSKIE: Our respective experiences in bartending. SCHLUND-VIALS: How is it working in the one close to campus? OSHINSKIE: Um, it was fine. Lots of Frappucinos. SCHLUND-VIALS: I wasn’t a flare bartender or anything like that and if somebody, you know, came to me and had a drink I didn’t know I would just tell them what’s in it? And if you couldn’t tell me what’s in it, you couldn’t handle the responsibility of the drink so I wouldn’t make it for you. OSHINSKIE: And the coolest part was, Cathy–as she told me to call her–didn’t just stare at me and wait for me to make conversation. SCHLUND-VIALS: Well how’s that class going for you? … Like what in particular … I’m just curious… Well how do you feel…? What’s your…What’s your family history?…I’m just curious from your perspective? OSHINSKIE: I didn’t have to try to sound smart. Or come up with thoughtful and provoking questions. We just talked. And it turns out Cathy had some of the same anxieties I did when she was an undergrad. SCHLUND-VIALS: When I was a student I never went to office hours — because I was nervous. I wanted to seem smart. I didn’t want someone to think I was like a dumbass. (laughter) And, you know, so what I would do was to just avoid professors. Like to the point where I would see them on campus and I would hide from them because I didn’t what them to see me, you know? So I completely understand. OSHINSKIE: Cathy is so funny. But when I asked her about it she like totally denied it. SCHLUND-VIALS: I don’t think I’m funny though. My brother’s so funny, like I think like Chris is funny, you know? I think that…there are certain things that make me laugh – My hatred or Arby’s. OSHINSKIE: The joke is she hates Arby’s. SCHLUND-VIALS: I don’t know. I wouldn’t say that I was a funny person. OSHINSKIE: Ok so maybe Cathy’s not doing stand-up or anything. But it’s not really what she says, but how she says it that’s funny. She uses this casual tone that can be self-deprecating. SCHLUND-VIALS: It was the 90’s and I was wearing Daisy Dukes and I thought that that was a good thing with a long shirt. Like, you know, it was not a good look. OSHINSKIE: Hi professor, can I come in? 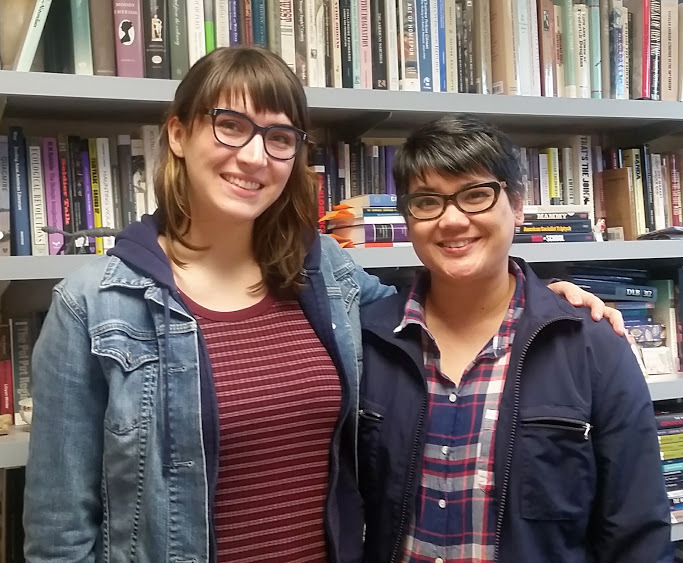 OSHINSKIE: I went to Cathy’s office hours to talk about race. SCHLUND-VIALS: To, um, you know put forth a position without seeming open is never going to convince anybody, right? So like, I never, and this is something that I am very careful about, I don’t like to bring politics, overt politics, into a classroom space. OSHINSKIE: I should mention that we were talking before November 8th. SCHLUND-VIALS: I was talking to a student about this in terms of Trump. Right, so obviously, well I think it’s probably obvious to students, but I’m like so far left, I’m like a Marxist. (laughter) I am, like I believe in the disillusion of the Nation state. Like I believe in all these things, but, I also don’t want somebody to feel that the conversation is shut down because I’m putting forward my political views. Because there’s a hierarchy that I have to, that is maintained in the classroom. So I ultimately have the ultimate authority, regardless of what I may say in terms of I want the student-centered classroom, I learn from students – these are all true – but at the end of the day I’m the one assessing, grading, and I have power in that situation. So if I actually invoke Trump, that’s going to shut down conversation because somebody in my classroom may actually be a Republican. So what’s more advantageous, to alienate that person and to fulfil every expectation of what it means to be a politically correct subject? Or to actually just let that person come to a conclusion based on the material I present, which is largely historical. So, so you’ll notice even in the class we’re taking, I’m much more a historically driven person because I think that history can be a guide – you know if students feel they can talk about the history with some degree of familiarity, then they are probably going to have a better informed sense of how to talk about race, you know? But I think that the problem oftentimes in certain classes, particularly those that have the diversity, gen-ed designation, is that the assumption is that you have to fix people when they come into your class, that somehow they’re racist, they’re, like, pathologized in that way, so it is, like, your job to kind of shot them down. And I think that that is really not–I mean you’re going to alienate–and you’re actually going to confirm various positions that everybody puts on you: like narrow-minded, bleeding heart liberal and all that other stuff. OSHINSKIE: What Cathy said was something I needed to hear. I left her office empowered. And then, the thing happened that no one expected –Trump won. OSHINSKIE: I was sitting in the studio putting together this podcast as the votes came in, and I knew that I had to go back to Cathy’s office. SCHLUND-VIALS: I’m still thinking through this because the day after the election I had a number of students come into my office and they were very upset. And I think the tendency for people–you had mentioned the generational gap–is to just tell people how they should they be feeling or how they should be thinking. Or trying to put it in a, you know, just a very theoretical framework…and that’s not the way people are experiencing this election, right? Or, or that’s not the way they experience the election. OSHINSKIE: The whirlwind of opinions, articles, and protests are telling me how to feel right now. And to be honest, I’m doing the same to others. I’m feeling history close in on me. I imagine my someday grandkids or kids asking, “what did you do then?” That anxiety narrows my mind at this moment. I want accuse and assume and yell because it feels like the right kind of radical action. Talking with Cathy, I saw her calm words and patient listening as radical too, a really necessary type of radical. SCHLUND-VIALS: I think that it’s a mistake to make the assumption that everybody who voted for a certain candidate was a racist. Um, you know, it’s a lot easier to make that claim rather than talking to people. But, you know, what really upsets me is just the, you know kinda, the shutting down of a conversation and not understanding that, you know, questions lead to more curiosity. I never get upset when someone asks me where I’m from. That’s a question that to me is a question that comes out of a true curiosity, treating me like a human being, not relegating me to the sidelines. But, you know, that’s not the best question to ask someone who’s Asian-American because there’s this long history of racialization, what-have you. But that’s not the time, to like, drop some science or, you know, spin knowledge on somebody because, you know, if I do that then I become–you know for better or worse–representative of a group of people. Because I think that when you accuse other people of being bigoted, or you, you know, accuse them of being on the wrong side of history–that’s not a very self-aware position. Because I don’t think any us are one hundred percent like perfect people in that regard, I mean, you can’t. OSHINSKIE: I wish I could have a moment at the end of this podcast that could make it all better. I wish I could know how to be on the right side of history. But I can’t–because there are more than two sides to history, and there are more than two sides to an education. When I went to Cathy, I might have hoped for it but I knew she wasn’t going to give me the right answer. Professors aren’t the keepers of truth who hand down some golden key on graduation day. Because truth can’t be kept and it’s definitely not locked up. We’re not in college to find the ultimate truth, we’re here to learn curiosity, the skill of curiosity, to pose questions and inquire, both in class and office hours. So don’t be afraid of your questions, even the ones that have been shut down, in fact, pull them out, dust them off, and find a professor to open them up with. Great podcast! Cathy is my favorite professor of all time and she totally changed my life. I wish I had talked other more often. I was so glad to hear this because I am struggling with a lot of these things right now and worried about how I will talk to students about race as a professor someday. Thanks for making this! Thank you for the kind words! You should tell Cathy that! And I’m sure she’d be glad to hear from you–office hours don’t have to end after graduation.